Join us every month for a new Create + Sip experience! Our afternoons of wine and fun offer more than just painting. Each Create + Sip is taught by one of Workhouse's talented studio artists, so we play with lots of techniques. You'll have a great time creating (and sipping), resulting in a unique piece of art made by you. Let the magic and peacefulness of the ocean wash over you during this very special Create + Sip. 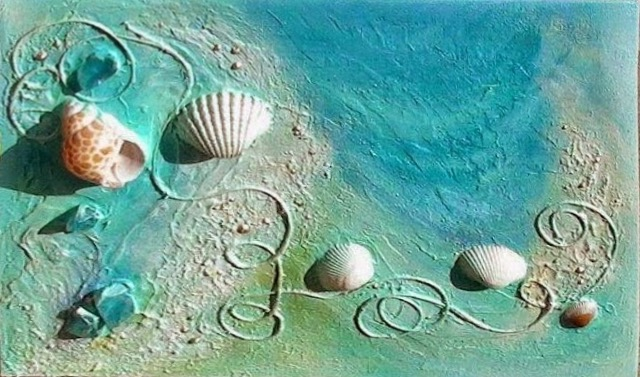 Former Workhouse artist Kathy Strauss now lives in Myrtle Beach, SC, but she's bringing the magic of the seashore to Lorton for an evening of fun, wine and creating. Kathy will show you how to use paint, shells, sand and other materials to make a unique piece of art you can take home at the end of the event.